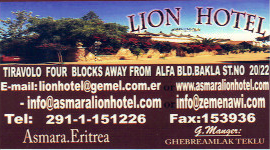 The many hotels, restaurants and pensions in Asmara cater to every price range and level of comfort. The gracious staff will try very hard to make your stay as pleasant as possible. Reservations should be made in advance. In Eritrea it is common for guests to inspect the room being offered before accepting it. Check if the shower and the toilet are in good order. Also check if there is hot water available and when it is turned on and off. Some hotels add 10% sales and & or service tax to the prices listed at the reception. Prices are subject to change or may vary, based on availability, season, lenght of stay and group discount. 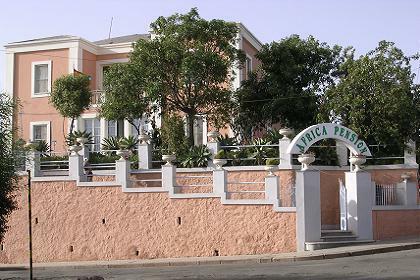 The Asmara Palace Hotel (Airport Road) was constructed in 1999.
swimming pool, a tennis court and other sports and fitness facilities. 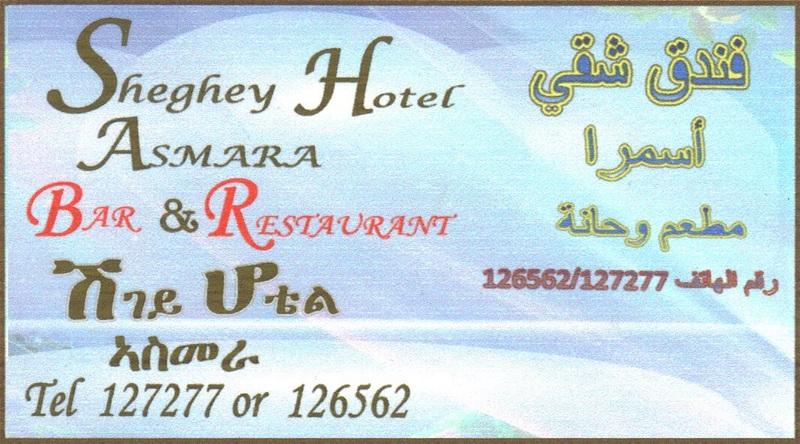 The hotel is just 1 km from Asmara International Airport, near the Expo. half of 2005, after a thorough renovation to restore its original grandeur. 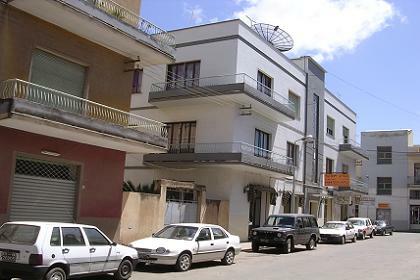 in Asmara's Italian villa quarter close to the city center. tish officers during the period of the British military administration. Acceptable Credit Cards: Visa, American Express, Master Card, Delta, & JCB Cards. Embasoira / Hamasien Hotel is beautifully situated only 200 meters from the city's shopping center and conveniently close to cinemas, post office, telecom office and Governmental Offices. Offers you luxurious comfort best International and National cuisine at very reasonable prices. We always greet our guests with courtesy and render quality service to make our Hotel "a home away from home" to all our guests. Additional Embasoira Restaurant offers (Buffet) & Cocktail Reception and Garden Restaurant. 8 channel Sat. TV .MM, SS. 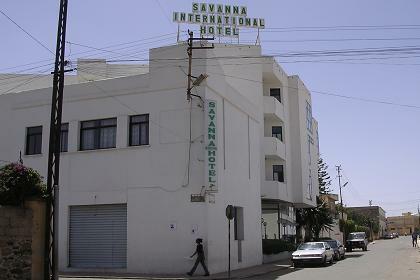 Sun Shine Hotel - next to the NICE Insurance Building Asmara. 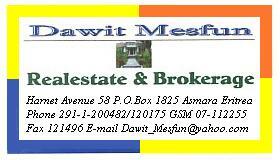 It is five minutes walk from downtown Asmara. Has 26 rooms and 4 suites with round the clock service. Each room is equipped with fridge, mini-bar, satellite TV and direct telephone. 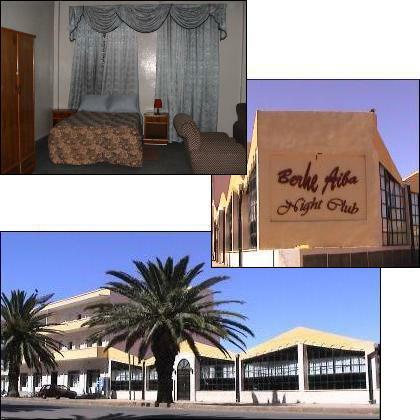 The hotel is provided with fax, internet service, photocopy and laundry services. Eat at our luxurious restaurant featuring national and international dishes. meditate in our superb terrace and garden bar which serves food, cold and hot drinks. Relax at our piano bar for an evening entertainment with live band (Thursday through Sunday). Relish our garden barbeque once a week. Use our professional conference room for 500 people. Enjoy our terrace for cocktail and special dinner (occasions). 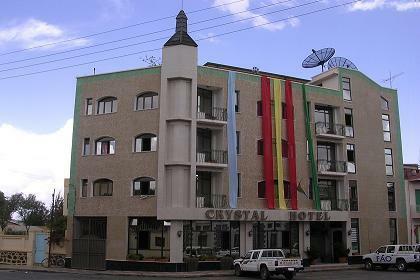 Crystal Hotel - just behind Cinema Roma in the center of Asmara. Room rates includes breakfast, internet access, service and sales tax. Crystal hotel Asmara surrounds you with gracious service and thoughtful amenities that help you make your stay in Eritrea a success. 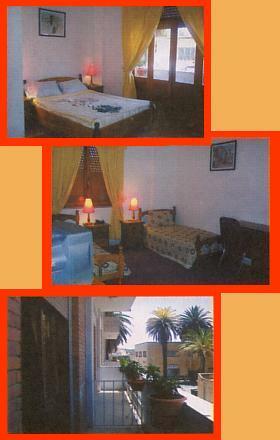 It is conveniently located in the heart of Asmara's government- and performing arts district. 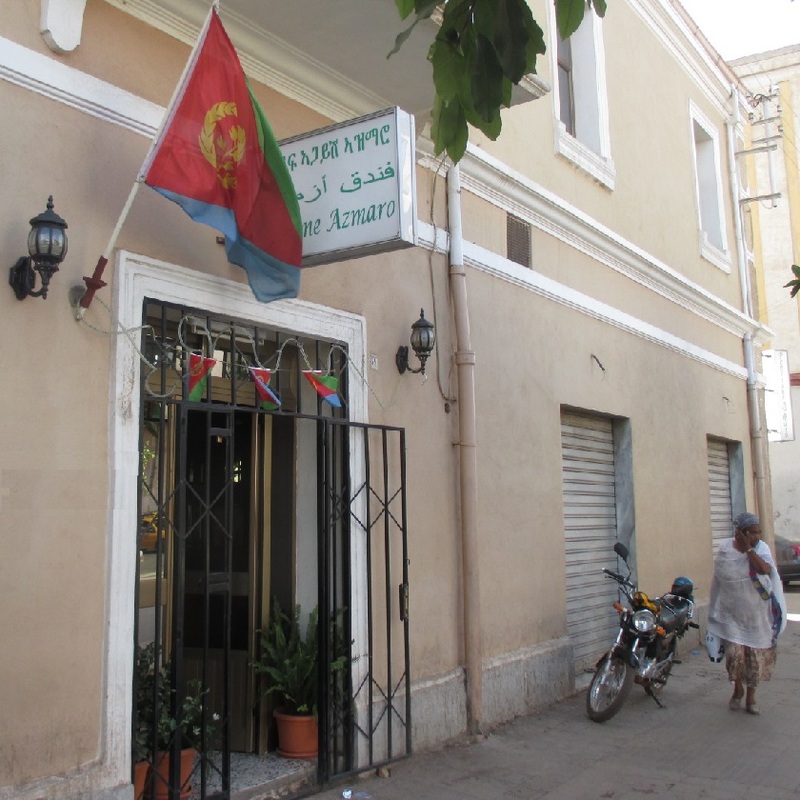 Interesting places that Asmara offers could be reached just by walking. A nice balcony and more. Conference hall with lap-top and projector. 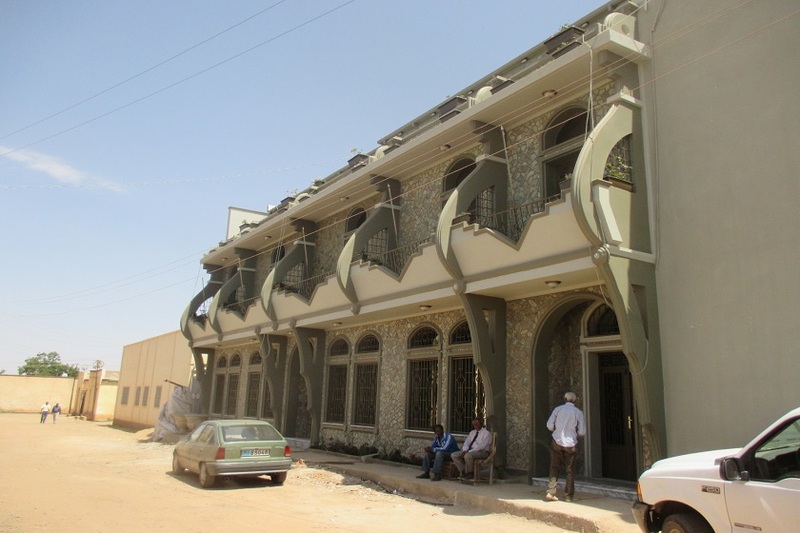 Midian Hotel - At a moderate distance from the center. Room rates includes breakfast, service and sales tax. 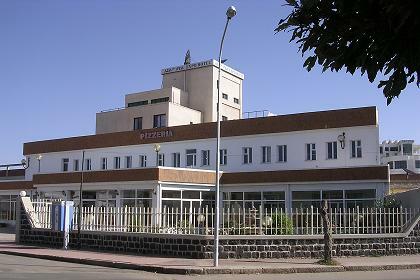 The Midian Hotel Asmara is one of the city's most modern hotels. 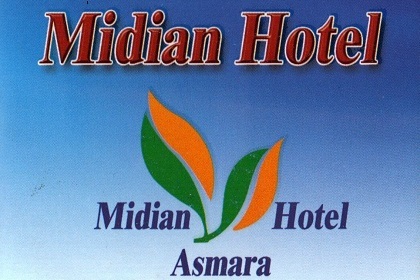 The Midian Hotel is located minutes from the airport and not far from the center of the Asmara. The hotel opened in April 2006 and surrounds a landscaped courtyard. When it comes to dining. guests have a choice of restaurant with its contemporary & menu, or there is the relaxed atmosphere of our Cocktail bar. The hotel bar is the perfect place for an evening drink. Savanna International. At a moderate distance from the center. Special arrangements for groups and long stay. Foreign currency exchange rates shall be the prevalent rates of the Bank of Eritrea. TV channels are available around the clock. Conference room for 250 guests with beamer and audio facilities. P.O. box 3754 Asmara Eritrea. 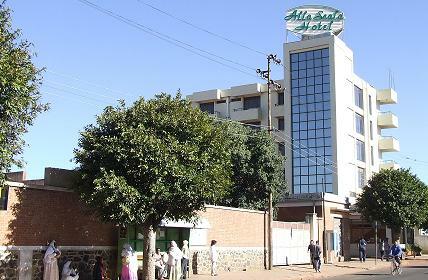 Alla Scala Hotel - Asmara Eritrea. Service charge and sales tax included. 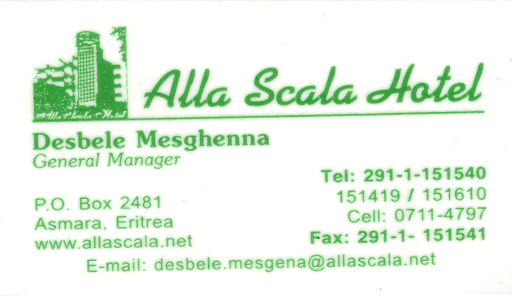 The Alla Scala Hotel is a modern four star hotel in Asmara Eritrea. 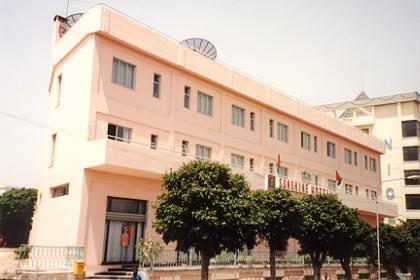 The hotel started its operations on May 24 2000. The hotel is about 3km. from Asmara International Airport, near the Expo and not far from downtown Asmara. 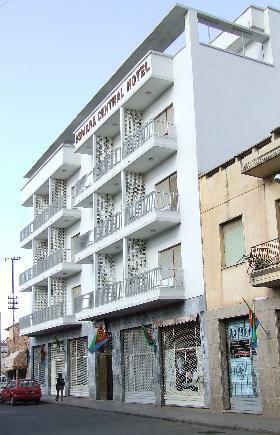 Bologna Hotel - Tiravolo Asmara Eritrea. Discount prices apply for long stay guest. Bologna Hotel has 69 different classes where guests will have opportunity of charming rooms to their disposal. Every room is furnished with modern and attractive furniture with multi channel TV, telephone lines, private bathroom and shower. We provide negotiable rates for groups and long term occupancy. If you come to Eritrea for business trip, a meeting or a visit, the Bologna Hotel is always ready to offer you magnificent services. The Bologna Hotel has a couple of spacious and well decorated restaurants, both national and international, that provide you with Italian menu and exotic national dish. Each restaurant has the capacity of 320 seats that can be easily converted to serve as a cocktail and other banqueting facilities. In the kitchen of the Bologna Hotel qualified cooks are catering international cuisine. The management point and its entire staff of the Bologna Hotel are ready for exceptional reception and multi services. 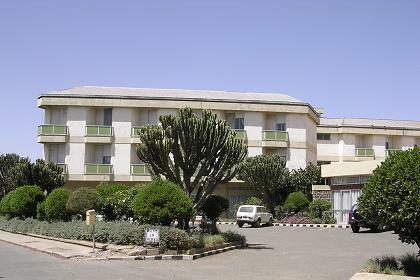 Expo Hotel - Tiravolo Asmara Eritrea. The management point and its entire staff of the Expo Hotel are ready for exceptional reception and multiservices. A couple of spacious and well decorated restaurants, both national and international, provide you with Italian menu and exotic national dish. Each restaurant has the capacity of 150 seats. Expo Hotel has 65 different classes where guests will have opportunity of charming rooms at their disposal. Every room is furnished with modern and attractive furniture, refrigerator, multi-channel TV and with facility of computerized direct telephone lines. If you come to Eritrea for a business trip, a meeting or a visit, the Expo Hotel is always ready to offer you magnificent services. far from Asmara's airport, three blocks behind the Alpha building. Above prices are inclusive of all taxes and service charges. 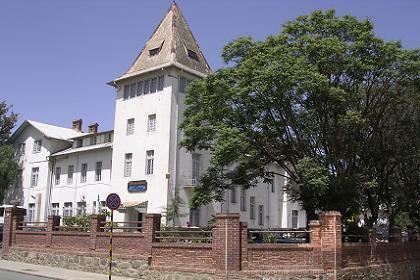 The Ambassador Hotel - Harnet Avenue Asmara. Service charges and sales tax included. "center of the city, center of excellent services"
as the Albergo C.I.A.A.O. (Compania Immobile Albergi Africa Orientale). 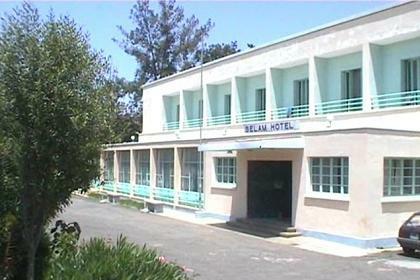 The Selam Hotel is one of the typical Art Deco style buildings in Asmara. 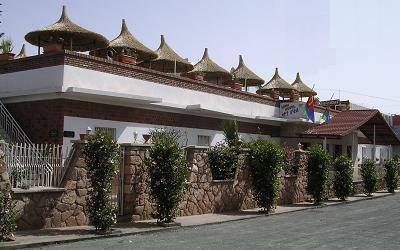 The Selam Hotel is located at a moderate distance from the city center. it was here that Eritrea was officially declared an independent state in 1991. P.O. Box 181 - Asmara Eritrea. The Top Five Hotel at a moderate distance from the city center. Marsa Teklay Avenue No. 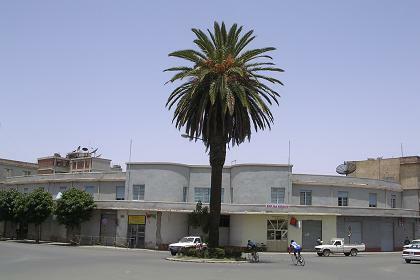 8, Asmara Eritrea. 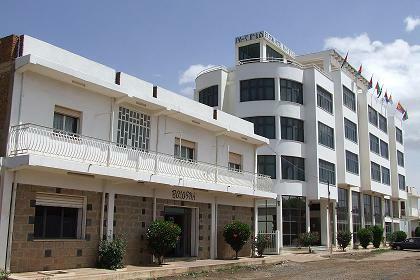 The Nyala Hotel at a moderate distance from the city center. Including sales tax and service charge. PO Box 867 - Asmara Eritrea. 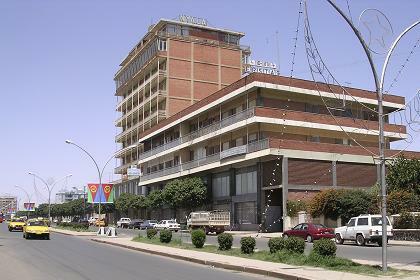 Asmara Central Hotel in the center of Asmara. 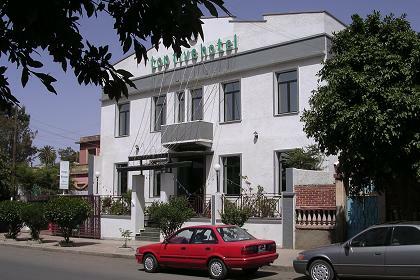 Khartoum Hotel in the center of Asmara. Sales tax and service charges included. 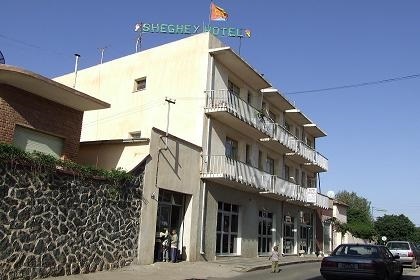 Sheghey Hotel, Bar & Restaurant in the center of Asmara. Azmaro Pension in the center of Asmara facing the Synagoge. Basic hotel with modern & clean rooms with (shared) showers & toilets in every wing and on both floors of the pension. The Bristol Hotel, a friendly, moderate hotel constructed in the 30's. 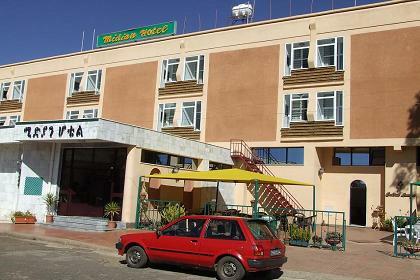 Berhe Aiba Hotel and Nightclub is one of the best dance music nightclubs and hotels in Asmara. If you are looking for a complete nightclub with hotel, restaurant and bar then you’ve landed at the right place. A former mayoral villa with colonial charm and a beautiful garden. 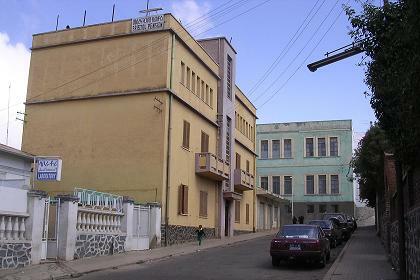 before liberation, it was used as a bar and by the Ethiopian Navy. 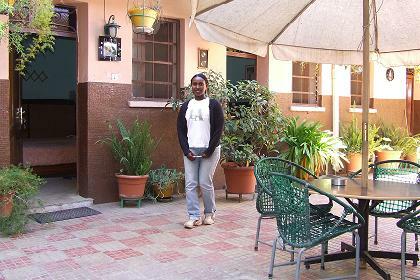 The Damera pension is wonderfully located on Godena Harenet in the heart of Asmara. The area has excellent public transportation connections and offers a vast choices of shops. This nice and cozy pension is perfect for a couple, group of people, tourists and business travelers. Situated on the first floor, it has a modern decorum and is elegantly furnished. There are double and single rooms with access to balcony. Each room has showers & feature color television with multi sky channel, direct dial telephone, refrigerator & internet access. Damera Cafe bar is located on the ground floor. Refreshments can be served in your room. The reception is open to take orders and answer any questions. on +291 (1) 124855 or 116944. 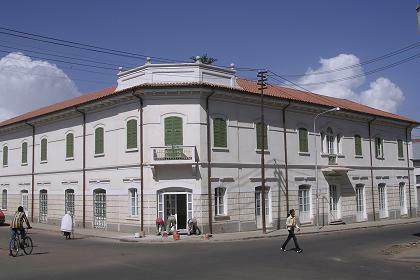 247 Harnet Avenue, Asmara Eritrea. 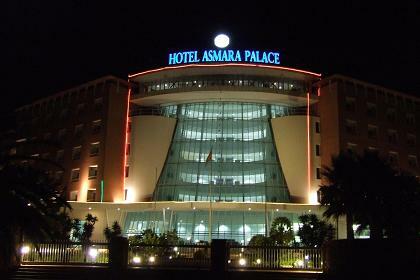 On You tube you will find a video impression of seven top class hotels in Asmara. Hotel, the Allascala Hotel, the Ambassador Hotel and the Sunshine Hotel. 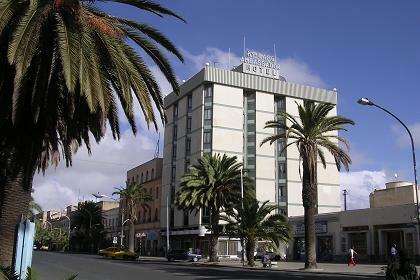 Asmara Intercontinental Hotel (now Hotel Asmara Palace).